Mounsif Ghninou and Adel Semmar, chefs and co-owners of Cafe Mediterraneo Ristoranti Italiano, started their culinary journey in 1983 working in Boston’s North End. In 1993 the two opened Cafe Mediterraneo, a small 40-seat Italian bistro located on Fleet Street in downtown Portsmouth. 9 years later they expanded into adjacent space to bring the seating capacity to 65. Having resided on a low foot-traffic sidestreet for years, the exposure was far more limited than other restaurants in the area. A small bar and waiting area that was often standing room only gave the incentive to expand once again. After 5 years, Cafe Med (as the regulars call it) had grown again by moving to 119 Congress Street. Adding 25 more seats, tripling the bar space and becoming a fixture in one of the highest-traveled areas of Portsmouth will allow new patrons and faithful regulars to enjoy Cafe Med’s continued success. The Italian bistro has been described as bringing the flavor of the North End to Portsmouth. 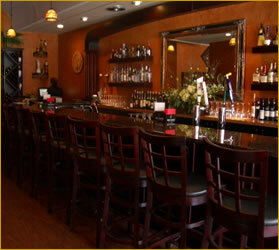 In 1997 and ’98, Cafe Med earned Yankee Magazine’s Editor’s Pick award, and for five years it’s been No. 1, topping the “Best of the Best” list for Italian in a national independent survey.